Gottfried Bernhard Göz. 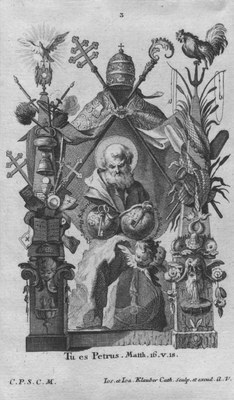 Saint Mathias. Ink and wash.
century. Museo del Carmen Alto, Quito. It was late in the 18th century that Bernardo Rodríguez painted a remarkable series of Apostles in Quito, Ecuador. 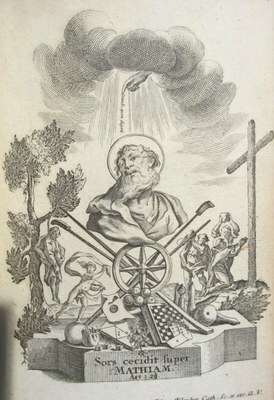 In all certainty, this series was based on a set of engravings done in the workshop led by Johann Baptist and Joseph Sebastian Klauber in Augsburg, Germany. And these engravings were in turn based on a series of drawings conceived by Gottfried Bernhard Göz, who was probably working specifically for the Klauber workshop in Augsburg . This creative sequence can be fully traced in the case of the apostle Mathias (see above). 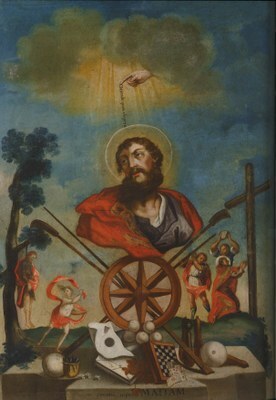 The series of Rodríguez consists of fourteen paintings—those of Christ, Andrew, James the Greater, Thomas, Bartholomew, Jude Thaddaeus, Mark, Simon, Mathias, Paul, John, Philip, James the Lesser, and Luke. Conspicuously absent from this list are the portraits of Peter and Matthew. Could it be that Rodríguez failed to paint them? This is all but inconceivable; Peter was the first of the apostles, the representative of Christ on Earth, and the visible head of the Church. And the importance of Matthew—the first of the Evangelists—had to be second only to that of Peter. So it is far more likely that Rodríguez completed the paintings of Peter and Matthew, and that these paintings have been lost, stolen, overpainted, damaged, or destroyed. Fortunately, the engravings on which these paintings would have been based have survived. They are shown below in the hopes that the Rodríguez masterpieces can be imagined today and recovered tomorrow. Saint Peter. Engraving. 18th century. Saint Matthew. Engraving. 18th century. 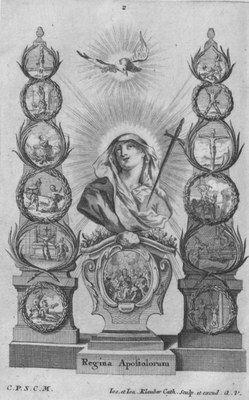 The Göz-Klauber series contains also a depiction of the Virgin as Queen of the Apostles (see below). Rodríguez is not known to have made a corresponding painting of this subject. The visitor is hereby invited to view the entire series of Göz-Klauber-Rodríguez apostles. The paintings themselves can all be found in Quito, Ecuador. The painting of James the Greater is kept at the Museo Pedro Gocial and all the others are housed at the Museo del Carmen Alto . 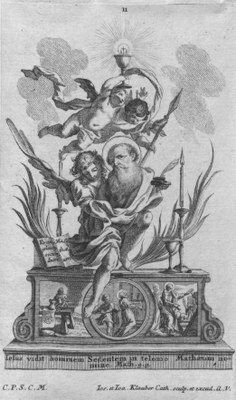 The Göz drawing reproduced above was taken from Eduard Isphording, Gottfried Bernhard Göz, 1708-1774. Ölgemälde und Zeichnungen . Vol. II, Weissenhorn 1984, ill. 266. PESSCA wishes to thank Peter Stoll (Augsburg University Library) as well as Edeltraud Prestel and Ursula Korber (Staats- und Stadtbibliothek Augsburg) for their help with the research and the materials presented in this gallery.